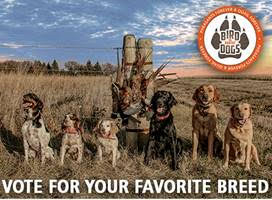 St. Paul, Minn. –– The unbreakable bond between an upland hunter and a bird dog is the motivation behind Pheasants Forever’s 2019 Bird Dogs for Habitat Campaign, challenging wingshooters to cast a vote and make a tax-deductible donation on behalf of their favorite sporting dog breed. All contributions support the nonprofit organization’s wildlife habitat mission – and the places where bird dogs love to hunt. Through online donations, Pheasants Forever will accept pledges in support of 49 different bird dog breeds; each $1 donated is equal to one vote. In other words, a $10 donation is equal to 10 votes for a particular breed of sporting dog. Thanks to the generous support of our 2019 campaign sponsors – Purina Pro Plan, Irish Setter and Ruff Land Performance Kennels – every donation made throughout the month of April will be matched at 3:1. New event partners for the 2019 Bird Dogs for Habitat Campaign include Project Upland and theNorth American Versatile Hunting Dog Association (NAVHDA). Project Upland joins as the official media partner for the Bird Dogs for Habitat campaign and will promote the fundraising and content effort to its growing upland audience. Project Upland is a unique online community that captures the passions and traditions of bird hunting for a new generation of upland hunters through social media, podcasts, short films and its quarterly Project Upland Magazine. NAVHDA, a Pheasants Forever partner in conservation, is a nonprofit organization dedicated to fostering, improving, promoting and protecting the versatile hunting dog in North America. Half of the bird dog breeds highlighted in the campaign are versatile breeds, and the month-long event is a continuation of an expanding relationship between the nonprofit to build the strongest link possible between bird dog owners and upland wildlife conservation. Weekly participant giveaways include a year’s supply of Purina Pro Plan, a pair of Irish Setter Boots, a Ruff Land Kennel, and yearly subscriptions to Project Upland Magazine. $35 = 35 votes and an Associate Pheasants Forever Membership, Limited Edition “Bird Dogs for Habitat” Decal, and a Bird Dog Bumper. $75 = 75 votes and a Rooster Booster PF Membership, Limited Edition “Bird Dogs for Habitat” Decal, and a Bird Dog Bumper. $500 = 500 votes and a Pheasants Forever Dog Life Membership (including SportDOG Brand® SportHunter® 1225 e-collar), plus Limited Edition “Bird Dogs for Habitat” Decal. Vote now and support wildlife habitat conservation efforts nationwide!